The modern design and straightforward operation make working with the PROGRES GRYPHAX® microscope camera software time-saving, intuitive and efficient. 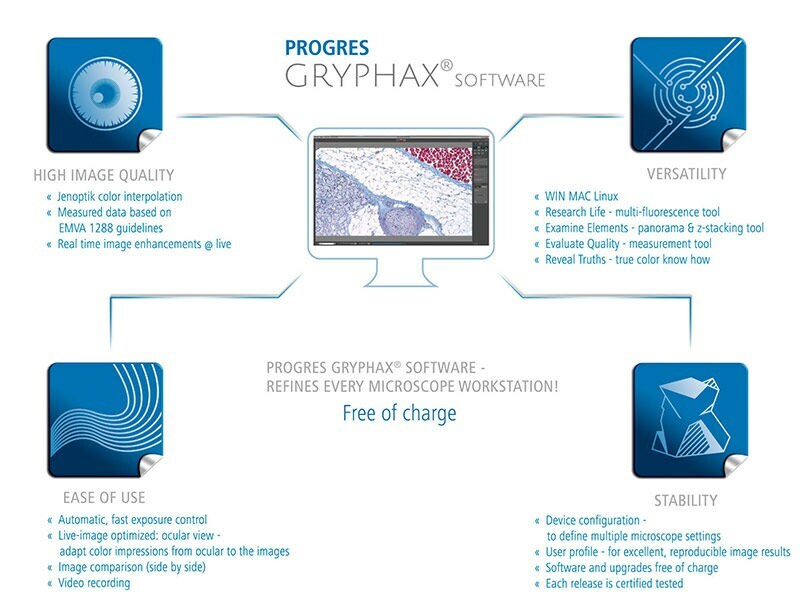 The user interface of the innovative PROGRES GRYPHAX® microscope camera software is structured and intuitive to learn. It is identical in Windows, MacOS and Linux operating systems, as are the functions, which means you can execute workflows in the same way on different PCs. As soon as the software has been installed, you're ready to capture your first image. Particularly noteworthy: Save time effectively! Optimize the quality of your live images in real time using the features and tools of the microscope camera software. Watch how your multi-focused image appears or see how your panoramic image (overview of the whole sample) is composed. Post-processing is hardly ever required, saving you time. You will receive the PROGRES GRYPHAX® microscope camera software along with your camera order. Our free of charge software updates mean you will always be kept up-to-date. Our efficient PROGRES GRYPHAX® series components also provide you with a flexible means of upgrading your microscope workstation. You want to increase the flexibility and application range of you microscope camera? Ask for our free of charge DijSDK to embed our PROGRES GRYPHAX® camera portfolio within the shortest time. Also specialized software solutions from our external software partners enable more versatility.